Picture of a Surgeon Holding Hands With a 21-week Old Fetus-Truth! & Disputed! - Truth or Fiction? Picture of a Surgeon Holding Hands With a 21-week Old Fetus-Truth! & Disputed! A picture is being circulated that says it is from surgery on a 21-week-old fetus…and the fetus is holding a doctor’s hand. The surgery cited in this story did take place, but the accounts of what actually happened are hotly disputed. Dr. Joseph Bruner at Vanderbilt is known for his work in fetal surgery, especially on babies with spina bifida, a condition in which the spine does not close properly during development. Vanderbilt confirms that little Samuel Armus was 21 weeks-old in the womb when this surgery took place in 1999, which made the surgery very risky because if anything went wrong, the baby wouldn’t survive on its own. Dr. Bruner and his colleagues, however, had done numerous successful spina bifida surgeries on fetuses that are not yet viable. In this particular surgery, photographer Michael Clancy was in the operating room to document surgery on such a young fetus. The surgery was successful and little Samuel Armas was born on December 2, 1999. 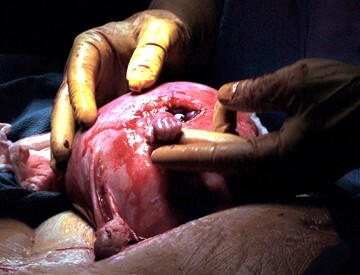 This picture of a 21-week fetus hand reaching up through an incision in its mother’s uterus to grab the finger of the surgeon who had just performed a life-saving procedure appeared in the November 16 edition of The National Enquirer. The 21-week-old unborn baby is named Samuel Alexander Armas, and is being operated on by a surgeon named Joseph Bruner. The baby was diagnosed with spina bifida and would not survive if removed from the mother’s womb. Little Samuel’s mother, Julie Armas, is an obstetrics nurse in Atlanta. She knew of Dr. Bruner’s remarkable surgical procedure. Practicing at Vanderbilt University Medical Center in Nashville, he performs these special operations while the baby is still in the womb. In the procedure, a C-section removes the uterus and the doctor makes a small incision to operate on the baby. During the surgery on little Samuel, the little guy reached his tiny, but fully developed, hand through the incision and firmly grasped the surgeon’s finger. The photograph captures this amazing event with perfect clarity. That picture should be shown on every television newscast and run in every newspaper in America. It is a graphic reminder that growing in the womb of his or her mother is a baby. It is not a “glob of tissue,” or “product of conception.” That pre-born baby is a human being with all the emotions, will and personality of any human being. That picture says it in a way that a thousand words cannot. Little Samuel’s mother said they “wept for days” when they saw the picture. She said, “The photo reminds us my pregnancy isn’t about disability or illness, it’s about a little person.” That’s what it’s always been about. That’s what the liberal elite have tried to get us to forget. May this image jog our memories so that we will never forget. American missionary sentenced to death in Africa after traffic accident-Fiction! Hidden code in Microsoft Windows says Bill Gates is the Anti-Christ-Fiction!